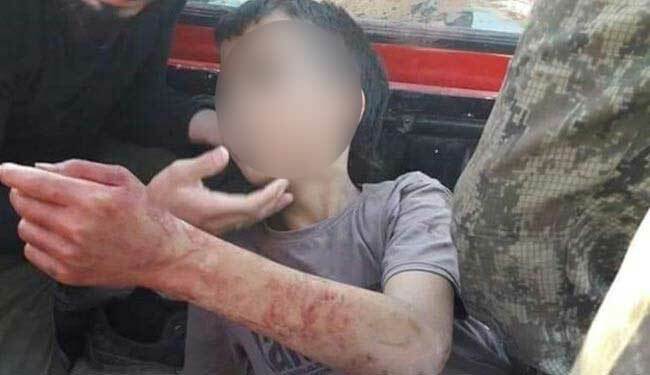 In a testament to the ill-c0nceivied, immoral, and outright vile war in Syria pushed by the US government, a 12-year-old boy was beheaded by ‘friendly forces.’ The gruesome and shocking murder was filmed and carried out by members of Nour al-Din al-Zinki — a group of ‘moderate rebels’ aided, funded, and armed by the United States. The Nour al-Din al-Zinki movement began in 2011 during the Syrian civil war and grew to be a powerful anti-Assad group with the help of the US. The group also reportedly fought against the Islamic State. However, as the video shows, their crimes against humanity are no different than the terrorist regime. The video surfaced on Tuesday and illustrates the sick reality created by US foreign policy. The first video shows five men posing with the frightened child in the back of a truck. Later, one of the men is seen cutting off the boy’s head. The incident is reported to have taken place in Handarat, north of Aleppo, where heavy violence has been prominent recently. The men in the first video say the child is a fighter from Liwa al-Quds (the Jerusalem Brigade), a Palestinian pro-government militia operating in the Aleppo area. Liwa al-Quds is a pro-Syrian government Palestinian paramilitary faction made up of the Palestinians who have been driven out of their homes in the Handarat Camp. They are not part of ISIS and only fight to regain their homes. However, according to the Liwa al-Quds, they said the boy, identified as Abdullah Issa, was just an innocent 12-year-old from a poor refugee family who lived in a rebel-held area of Aleppo. Earlier this month, Amnesty International released a report detailing the horrid abuses of the Nour al-Din al-Zinki Movement. The group, who’s received everything from anti-tank missiles to cash from the US, stands accused of unspeakable human rights abuses, including abductions and torture — and now, publicly removing the heads of children. Judging from the boy’s appearance of ragged clothing and abrasions on his body, it appears that he was impoverished and possibly tortured before he was murdered. The second disturbing video shows a man behead the child using a small knife, after the child is laid laid down on the trunk with his hands cuffed behind his back. With the Allahuakbar shout, the executioner holds high the child’s head then puts it down on his back. The video’s release prompted a response by the State Department on Wednesday. And, only after the world became enraged did the US decry the murder. “If we can prove indeed what happened and this group [al-Zinki] was involved in it, it would give us pause about any assistance or frankly any further involvement”, U.S. official Mark Toner told reporters at a press briefing today. “I can’t take what these consequences would be, but this certainly would give a pause and we’ll look at any affiliation or cooperation with this group,” he reiterated. 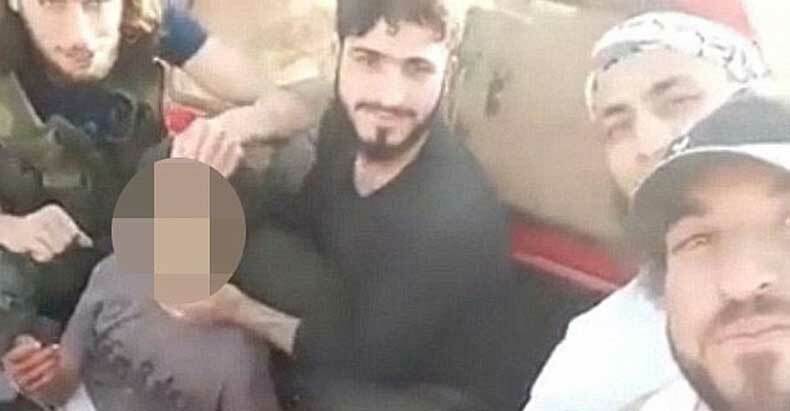 News of this beheading came on the same day that US coalition forces bombed the village in Manbij’s northern Hazawneh quarter in Syria, killing dozens of innocent people, many of whom were children.